Kobo has just announced the Forma e-reader and this device features a giant 8 inch screen and manual page turn buttons. Ebooks can be read in both landscape and portrait mode and it even has built-in Overdrive library functionality. The Forma has an E-Ink Mobius display, which is flexible and made of plastic. It is 15% lighter than the Kobo Aura One and weighs 197g. Kobo has disclosed that this their most durable eReader ever and should withstand drops of more than 2 meters, as well as more bends, twists, full handbags, and overloaded backpacks than any previous eReader. The spec sheet for the Forma mentions that it uses both Mobius and Carta HD. Like most display technologies, E Ink displays use an active matrix thin film transistor (TFT) backplane. The TFT backplane is an array of transistors that are typically deposited on a piece of glass. These transistors control each pixel on the display. The layer on top of the TFT backplane determines the actual display type (e.g. E Ink, LCD, OLED, etc.). In the case of E Ink, this layer contains the actual ink particles that creates the image. The Carta technology is the latest version of this layer and determines the optical properties, such as contrast ratio. The Mobius technology replaces the glass TFT backplane with a flexible plastic TFT backplane. This plastic backplane is thinner, lighter and stronger than glass backplanes. This in turn enables Kobo Forma’s lightweight and ergonomic design. The 8 inch display has a resolution of 1440 × 1920 and 300 PPI. It is powered by a Freescale IMX6 Solo Lite 1 GHZ processor. It has 512MB of RAM and has two different storage options, 8GB and 32GB. It does not have an SD card. This device has a front-lit display and also a Comfortlight color temperature system, so you will be able to read at night. It will have both white and red LEDS, it looks like it has 17 lights total for even light distribution across the screen. It is also waterproof with an IPX8 rating, so you will be able to use it at the beach in the bathtub and it can be completely submerged for up to 60 minutes. Many people have stated that Kobo has borrowed heavily from the Kindle Oasis from a design perspective, but I think Kobo is doing something far more interesting. The back of this e-reader is completely flat and can be held with one hand. Whereas the Kindle Oasis has a small hump, where the battery is. The Forma also has a far superior battery, which should last around three weeks on a single charge. The Kindle Oasis 2 has a 1,000 mAh and the new Kobo Forma has a 1,200 mAh battery. “Our top customers spend an average of three hours per day on our eReaders. In fact, tens of thousands of our top customers read 7 to 8 hours per day, and that is exactly why we continue to innovate to make our devices beautiful and comfortable for full-time readers. These booklovers put reading ahead of all other forms of entertainment, and with Kobo Forma, they can comfortably read for as many hours as they desire. It’s the latest big step in our quest for the perfect reading device,” said Michael Tamblyn, CEO, Rakuten Kobo. “Kobo’s team of reading scientists and designers worked relentlessly to perfect the most comfortable digital reading experience for booklovers. 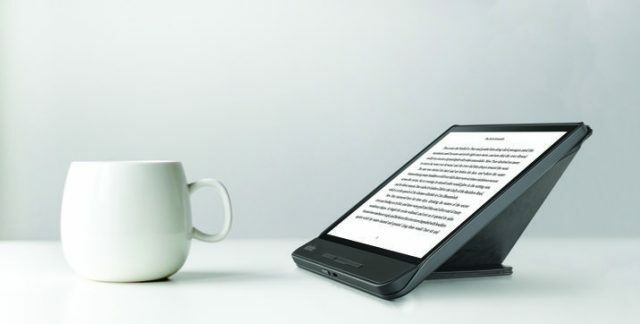 We investigated what readers want in an eReader and focused on its weight, shape, size, and materials to ensure Kobo Forma feels perfect in their hands,” said Ramesh Mantha, VP, Product, Devices. 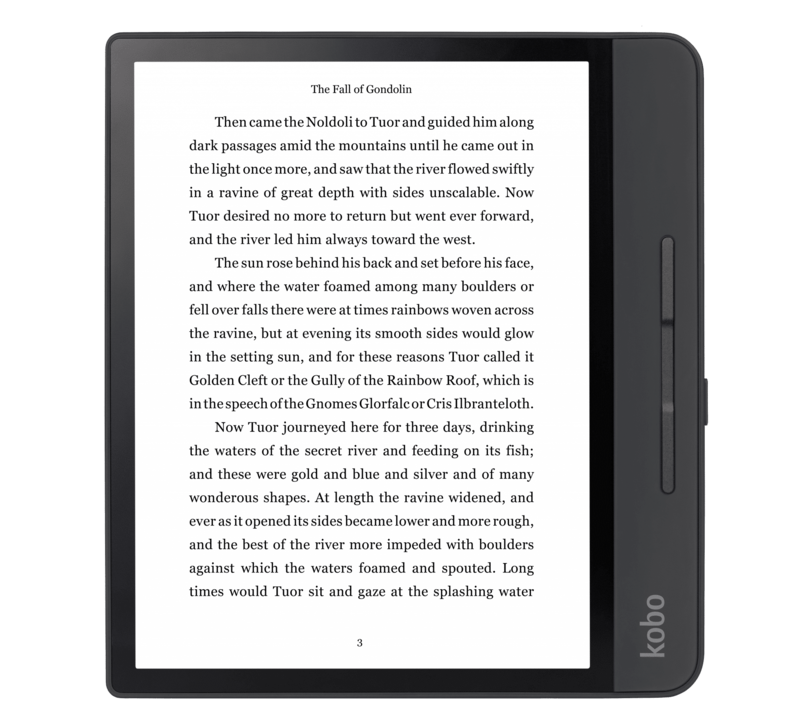 Kobo Forma, with 8GB of storage, will be available in black and will retail for $299.99 CAD, $279.99 USD, 279.99 Euro and 239.99 GBP at select retailers and at www.kobo.com. Pre-orders begin October 16, and as of October 23, Kobo Forma will be available in stores and online in Canada, the US, the UK, Italy, the Netherlands, France, Japan, and Spain; and as of October 30 in Australia, New Zealand, Switzerland, Sweden, and Turkey; early 2019 in Mexico. Kobo Forma with 32GB of storage will be available in Japan October 23, and will be available in other countries at a later date. Good e-Reader has the Kobo Forma in our studio and currently in the process of conducting an unboxing and review video. They should be available on the Good e-Reader YouTube Channel this weekend. A full and comprehensive written review will be available on Friday or Saturday. And please compare the comfort light to other devices. Looks even more impressive than I first imagined when this was just a picture. This is a beautiful device. Are they only 8GB no 32GB? I wish it was cheaper. Its a little steep given I just got the oasis around the same price point. For the review please let us know how holding it compares to the Oasis. Also how the battery compares to the Oasis. And can the text be inverted to white text, black background? Can’t wait to learn more! I’m curious about it. It does look pretty good, but I’m sticking with my Kindle and waiting to see when they come out with the night light comparable features. In the review (or here) could you please confirm that the reader can be flipped 180 degrees and used with the buttons on the left side? Thanks. Its not just you, but what’s with the obsession over USB-C? The article says there’s a 32g option. There’s a French unboxing video on YouTube where they show this happening. I’d like to buy a 10.3′ boox note with frontlight . You can do so much more with android , 1ghz single core cpu what a joke ! and at the same price as the 7.8″ octocore android ereader . I’m currently in that process where I’m starting to upgrade a lot of my tech after a few years, and would like to consolidate my charging requirements. My laptop and phone already use USB-C, the headphones I’m planning to buy will be the same, and it would just make sense for my e-reader and subsequent purchase to all suppprt the same charge port. Any tech released now with micro-usb will immediately become significantly obsolete with marked decreased retail value once USB-C refreshes hit the market (Ie. Sony 1000XM2, Surface, etc). The micro-usb stragglers are like the last of a dying generation. You can plug in the cable any way round you like. Type C often supports better fast charging options. Faster transfer/sync speeds with a newer/compatible PC or laptop, still backwards compatible with older PC’s by using a type C to A cable. Just quality of life stuff really, nothing really essential, but if your spending $300+ I feel they probably should have used a more future proof interface, not micro USB which is in the middle of being phased out in the tech industry. This is the one that I’ve been waiting for. In an e-reader, none of that matters. This *should* be good for about 19-20 hours, based upon a 20% larger battery. As I said in my original comment:- “just quality of life, nothing essential” but still can’t deny it would be a nice addition. Please review how it handles PDF files. This may be the first Kobo screen large enough to make it worthwhile, assuming the rest of the file handling experience is acceptable. Looks great. I’m still using the Aura HD from years ago, and it’s working fine, so I’ll probably wait awhile. Inaccurate. Sure charge and transfer speeds aren’t essential, but having an outdated, soon to be entirely phased out charge port is unacceptable. I have a power block with a single USB-C cable (C type on both ends) which I use to charge every other device, it’s unreasonable to pay $300 and have to carry around an additional cable for no reason. I’m very tempted–except for two things: 1)The Verge says the 32GB version is only for Japan, at least for now; 2)The 8 inch display means this won’t fit even the pockets in my cargo pants. I really want a pocketable version of this! Well this e-reader is like the successor of the Aura One..
Really, Kobo!? No inverted colors. Again. Easy hack or no deal. We will do this, but I heard it can be switched 360 degrees. So it will be ideal for people who are left-handed. Apparently it has a Carta HD layer, but I am not sure how this is working in conjunction with mobius. I don’t know, I read it from a lot of ppl that they don’t like the form factor of the current (9th gen) oasis. I just don’t get it: having a bump in the back of the device, where the battery is (the heaviest part of the device) is placed exactly where you would hold it: meaning, that the center of gravity is right in your hand, meaning there is no torque pulling the device out of your hand. If you are holding your device in one hand, that is. Compare it to any other eReader which has a more uniformly distributed mass. That’s why I don’t understand the applaud of the Kobo Forma not having a bump in the back (suggesting a more uniform distribution of mass). If you are holding your device with one hand (like you do with a smartphone for example), then, in my opinion the oasis has the best weight distribution for extended reading sessions. In my opinion, this design: having a wide bezel only on one side of the device is intended and most practical for a one handed grip. Or at least I find it very comfortable holding the current oasis with one hand for an extended period of time. Yeah, the oasis sure looks unusual, until you put the original amazon cover on it (which is unfortunately discontinued). Anyhow having an 8″ screen with a 300PPI resolution and a comfortlight must be nice. Maybe a bit offtopic, but what I really don’t like, is the closed ecosystems of these vendors. I’m heavily invested in the amazon ecosystem, because I bought a kindle and bought my books in the amazon marketplace. Now buying a Kobo, if they came out with a better reader, would be a big hassle (transferring my whole library of books). Also I really like the ability to switch between the ebook and the audiobook of the same title (most of the time) seamlessly. In fact I like it so much, that not having this ability become a deal breaker for me, despite that having an 8″ screen would be rather nice indeed. Guess I’ll have to wait until amazon comes up with an 8″ oasis with comfortlight included. Now I am confused which one to buy. Should I go ahead with Kobo e reader or Amazon Kindle. Any guides on the subject would be really helpful. Thank You. Clara, Aura, Aura h2o, all current smaller Kobos. Can you test EPUB3 compatiblity (having to use the Kobo app to read my Warhammer Codexes), big PDFs (got some of the 2000AD PDFs but my PRS-T2 is getting a bit long in the tooth now) and annotation/note taking? Thanks. how comfortable it is to be held with one hand, over a long period of time? Yes it does. It can be annoying to have to pack an extra USB-C to Micro-USB-Cable when you travel (if your E-Reader is your only device having that legacy connector). Faster charging via USB-C also isn’t a bad thing, I suppose. I don’t plan to replace my E-Reader every other year, especially not at this price point, so when I buy a new one, it should support the current USB standard connector, not one from 11 years ago.